Will The Low Cost OnePlus One Really Kill $600 Phones? Wednesday, OnePlus introduced the OnePlus One, a smartphone that offers the same specs as high-end and expensive counterparts for just $299 without a contract. If you walk into a U.S. wireless carrier today, for example, you'll drop about $199.99 for a flagship smartphone and then you're on the hook for two years. If you want a Galaxy S5 without a contract you'll need to cough up about $649.99. Consider this, though. Both the OnePlus One and the Galaxy S5 offer Snapdragon 801 processors. The Galaxy S5 has a 5.1-inch display with a 1080p resolution while the OnePlus One has a larger 5.5-inch 1080p screen. The S5 has a better camera, but the OnePlus One has more RAM and a larger battery. All said, the Galaxy S5 still costs $350 more. And don't tell me that it's the cost of the fingerprint reader on the S5, because we know that costs Samsung about $4 to add. The OnePlus One might seem like other devices because it's priced similarly to the Nexus 5, but it's really a totally different beast. Let's figure out what's going on here, how that might be possible, and if it can really kill off $600 smartphones. The OnePlus One joins the Nexus 5 as an affordable but high-end smartphone. Google's Nexus 5, however, still costs about $50 more out of the gate. Meanwhile, other offerings like the Moto X offer first-rate software experiences but, again, don't have the same kind of hardware that the OnePlus offers. The Moto G is compelling at $179, but like other super low cost options it still lacks LTE connectivity. The OnePlus One doesn't have any of these compromises, though. So what's going on here? How can OnePlus make such a nice smartphone and sell it for such a low cost? My guess is that OnePlus isn't making much off of its handsets and is instead selling at such a low cost to help build its name among smartphone customers. This is basically the opposite of what Apple does with the iPhone 5s, Samsung does with the Galaxy S5, and HTC does with the One (M8). To understand how much it's making we have to look at the bill of materials (BOM). Since we don't know it yet, we'll look at the BOM for the Galaxy S5, which has parts that are as close as I can find. The Galaxy S5 costs Samsung about $265 to build according to IHS. The display is the most expensive component in the Galaxy S5 at about $63 — and Samsung has one of the best screens on the market. OnePlus may have saved a few bucks on each unit by using a different display, that much is likely. Costs also probably vary depending on the bulk orders and deals OnePlus has in place with providers, but my guess is the company is paying more for labor than Samsung, which has its own factories. Even still, if OnePlus was able to build each device at a cost of $265, it's only making $34 on each 16GB $299 handset sold — and that's not taking into consideration its marketing, paying its staff, the lease on its building and other expenses a company has. It may make a bit more on its 64GB model, which costs $50 more at $349. In the end, I'm sticking by my theory that OnePlus isn't making any money off of these phones — I'm not sure where there's room to budge — but I may be wrong. Why Do We Pay So Much Now? I think, generally, we've been convinced that we need to pay obscene amounts of money for smartphones because we think we're paying for quality. The iPhone 5s is one of the more luxurious smartphones on the market, and the One (M8) now joins it, but with all of that aluminum and glass, it still only costs Apple about $207 to build each iPhone 5s unit. Wireless carriers take on that expensive asking price of the iPhone 5s and others, because there's demand for the iPhone 5s and other high-end flagships, and then are subsidized to make them more affordable. We walk into a store, pay $199 for a phone we assume actually costs $650 and walk out. Right now, most people aren't really complaining about this process. Carriers dislike it to some degree— they're the ones taking the risk of buying these hugely expensive devices and the ones who face declining margins from the practice, but they also get you locked into a money-making long-term contract. That's just how the industry works and has worked for as long as I can remember, and those incredible gross margins are why companies like Apple sit on large piles of cash. Can OnePlus change that? Now we're back where we started. 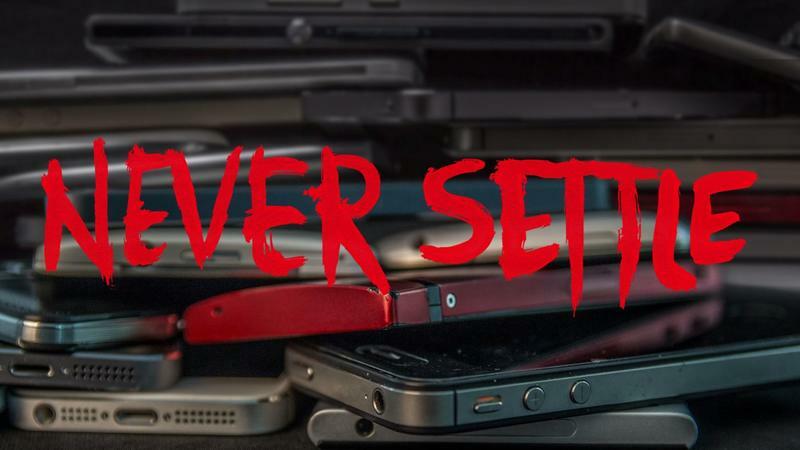 Can OnePlus change the industry? Will it prevent Apple from ever charging $600+ for the iPhone 6? I doubt it. I don't think $600 smartphones are going anywhere, but I wouldn't be surprised if the subsidies do. We'll probably all be paying the up-front cost for smartphones soon, which isn't out of the norm in Europe. When that happens, firms like OnePlus will probably be ideal for consumers who want first-rate devices without burning a hole in their wallets. Apple probably won't try to change its margins anytime soon — not unless sales of the iPhone start to nosedive. HTC and Samsung aren't going to just turn around and sell prices at lower margins, either. These firms have boards and shareholders to please, who rely on high margins that generate profits. OnePlus One can take the risk — it may not need to generate profits as quickly, and a low-cost first entry to the market helps drive consumer attraction to the brand. We may see new entrants, and we'll see prices of powerful smartphones dive as parts are commoditized and cheaper to manufacture, but maybe a few more years from now — not today or tomorrow.